No matter who you are or what you do, you have a personal brand. Geni Whitehouse, well-known speaker, former Sage VP, published author of “How to Make a Boring Subject Interesting,” and entrepreneur/principal with Even a Nerd Can Be Heard, will be presenting a session on building your personal brand (BB07), tomorrow morning at 9:45.
being remarkable in some way, eg: the name of your company, bright colors, a cool purse, outfit, etc. Be interested and curious in others, and go from there! To find out more, check out Geni’s session, her Web site, or follow her on Twitter. 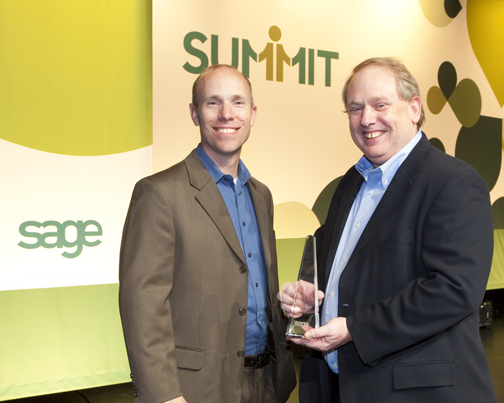 I got a little bit of a surprise today in the Sage Summit breakout sessions. I was covering BB01, “Effective Team Leadership,” for a friend who couldn’t make it there due to a scheduling conflict. Normally, I wouldn’t be anywhere near a session like that because it’s outside my normal practice–I focus mostly on community use of social media, and the interaction of a business with its customers. Plus, as a self-employed consultant with no plans to hire staff, I didn’t hold out much hope of getting personal value. “People won’t change unless you do.” Makes sense to me; one of the definitions of insanity is trying the same thing repeatedly in hopes of different results. If your team is not meeting its goals, look to what you’re doing before you try to correct them. “When you play Follow the Leader, you have to have your eyes open.” This goes for leaders as well as their teams. A person with closed eyes will lead others astray, and following with closed eyes doesn’t prevent stumbles. In an effective (if trite) demonstration, Hedley had the group follow instructions to fold and tear a sheet of paper with our eyes closed. The results were predictably scattered. “When you aim at nothing, you hit it every time.” This was one of several references to golf, in this case the driving range. Improvement in play comes from playing the game, keeping score, and seeing instantly what you’ve done right or wrong–not from smacking balls as far as you can. Measurement is one of the keys to effective leadership. Leaders must have a vision of where they wish to lead, but the only way to connect that vision to results is to measure. This also provides the team with clear expectations of what they need to do and how they stack up against those expectations. In the end, I realized that even a team of one needs leadership. Choosing a goal, identifying the steps needed to reach it, and measuring the progress is pretty much the only way to operate that makes sense. I’m glad I went to this session, and I never would have on my own initiative. At least that’s my impression of the session. I’d like to hear what some of the other attendees got out of George Hedley’s session on effective team leadership. I’d have asked when it wrapped up, but it was the last session before lunch, so the crowd looked hungry and cleared out fast. Marshall Lager is founder and managing principal of Third Idea Consulting LLC, a firm founded to provide advice on the confluence of customer relationship management (CRM), social media, and brand management. He can be reached through his Web site www.3rd-idea.com and is @Lager on Twitter. Family businesses face different challenges with succession planning due to the close-knit interpersonal relationships that come with running such a business. Whether planning ownership, management or exit strategies, Wayne Rivers of The Family Business Institute helps business owners when passing on or leaving their companies. In today’s “Succession Planning” session, Rivers described the benefits of The Family Business Institute’s “Stress Test,” which helps companies identify how to plan for a successful future under any circumstance: sustaining healthy sales and profit margins; declining revenues or margins; new market or product expansion and more. From directing Entrepreneur Magazine as Editor-in-Chief to high-speed motorcycle racing, Amy Cosper embodies the same passion she sees in the entrepreneurs she writes about. Cosper explained that passion, along with an unending need for the adrenaline rush that comes with running a business, are common attributes that drive all entrepreneurs. In today’s session on “What Makes Entrepreneurs Tick,” Cosper also covered an assortment of fun and fantastic examples of successful entrepreneurs – the makers of man-skirts, tattoo artwork for casts, bar-hopping trivia quizes, and more! 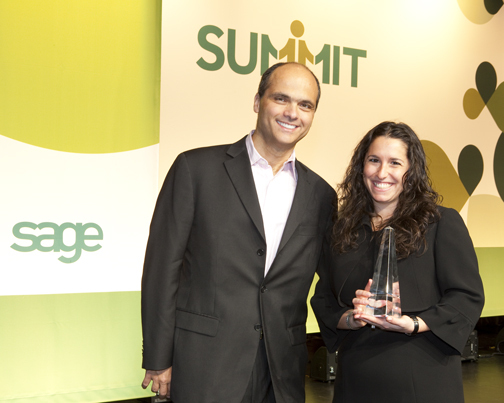 Sage North America, whose business management software and services are used by more than 2.9 million small and midsize businesses in the United States and Canada, announced today the winners of its second annual Customer Awards Program. 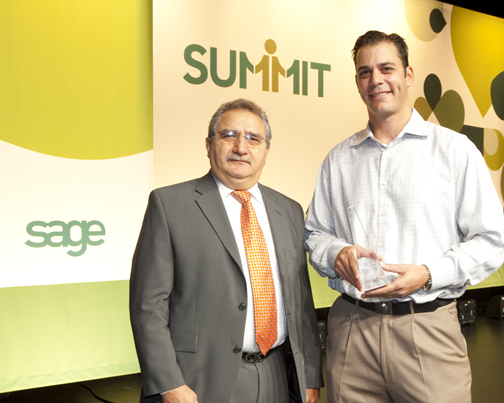 Six companies were recognized at the Sage Summit conference in Atlanta, GA. 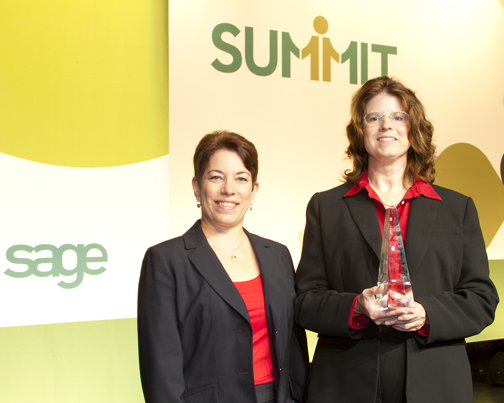 The Sage Customer Awards Program recognizes the outstanding business achievements of customers using Sage products and services. Best End-to-End Deployment – Power Curbers, Inc.
Best Innovation Award – Entertainment Lighting Services, Inc. Lifetime Achievement Award – Amix Salvage & Sales Ltd.
A live Webcast will be available for anyone interested in participating remotely. You can register for it at www.sagecrmsolutions.com/socialcrm. 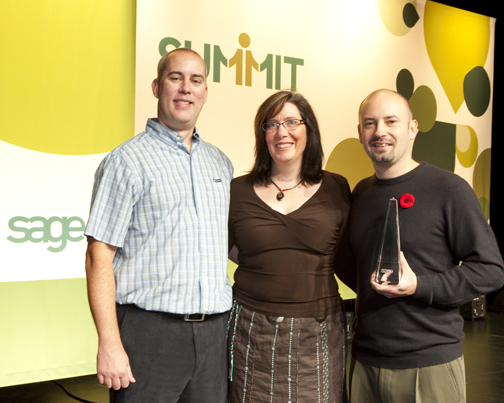 You can find additional insight from Brent on his Social CRM Blog and by following him on Twitter. 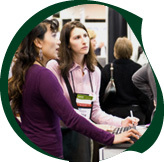 A social media press release regarding his Sage Summit appearance available here, and Brent also made this brief video to encourage everyone to attend.